A collector’s dream perhaps, a Jeweler’s Fancy gemstone ring fantasy?. Dreams and fantasies be gone because we have Wholesale Fancy Sapphire Large Stones from Ceylon here and wholesale Ceylon Sapphires in Blue, Pink Purple and White Sapphires in bulk and large sized too. What Is a Fancy Sapphire? Sri Lanka and Thailand have historically been important sources of Natural Fancy Sapphires. Smaller amounts comparatively have been produced in many other countries. We source our Fancy Sapphire Large Stones from Ceylon (Sri Lanka) and though we source Sapphires from others, Ceylon Sapphires are from the best source and best quality for the market and your Ceylon Sapphire Engagement rings. The corundum stone has one of the greatest natural color ranges in mineralogy. It occurs in nice hues of red, orange, yellow, green, blue, and purple. Corundum of other colors are produced when trace amounts of other elements or defects in the corundum crystal lattice cause selective absorption of certain wavelengths of light. The causes of color in Ruby and Sapphire are both well researched and well documented. Chromium is the primary cause of the red color of Ruby and the color of Pink Sapphire. A combination of iron and titanium causes the color of Blue Sapphire. 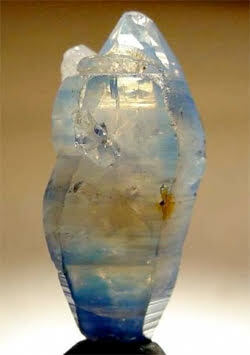 The cause of color in the many hues of Fancy Sapphire is less well researched. Vanadium can cause a grayish blue to green color. Iron and a missing electron can produce a strong yellow color. Iron alone can cause a pale yellow color. Chromium with a missing electron can cause an orange color. Interactions between some trace elements and lattice defects produce many other colors. The most popular colors are usually pure hues, such as red, orange, yellow, green, blue and purple. 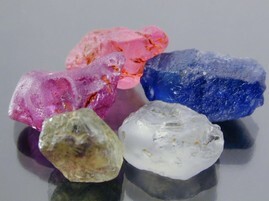 All of these, with the exception of emerald green, are found naturally in Sapphire. The Ceylon Blue Sapphire is known for its beauty, possessing the glorious Cornflower Blue Sapphire shade, as well as for being one of the few Sapphires in the world that can be sold as a completely natural stone without heat treatment. The blues aside, the fact that Ceylon Sapphires also come in many beautiful hues and these highly marketable qualities of Ceylon Sapphire, has created a brand recognition world wide. Our Natural Blue Sapphire and our Fancy Sapphire Large Stones from Ceylon are very popular with our Gemstone Jewelry and our Collector clients. For those who prefer the light livelier Fancy colors, Sri Lanka (Ceylon) is the locality of choice and for Fancy Sapphire Large Stones from Ceylon, it is king of the hill. Within this scenic small island are found Sapphires of virtually every color, including some for which the island is the best source, such as the lovely pink-orange Padparadscha Sapphire which we can also supply you with. 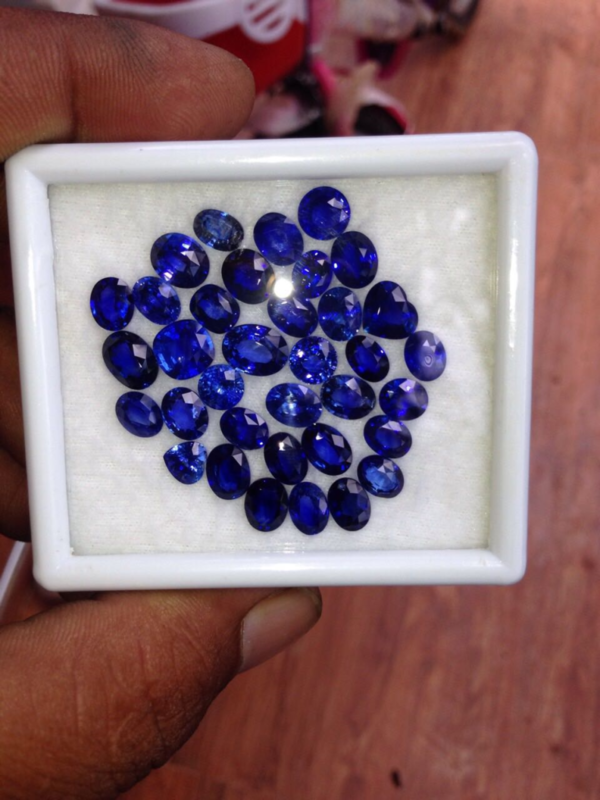 Our Ceylon Sapphire price per carat at wholesale is just what you need. As an international supplier of wholesale precious and semi precious gemstones, we source from only ethical sources and take pride in our Fancy Sapphire Large Stones from Ceylon mines and we also inspect the mines ourselves as we do other mines that we use. In Ceylon (Sri Lanka) we the mines also adhere to green laws within the country to sustain the beautiful natural landscape and livelihood of its citizens. Source your Large Ceylon Fancy Sapphires from Us. Click the Contact Us link here and find our email there or fill out the convenient Inquiry Form. We will reply to your inquiry or order and provide your Ceylon Sapphire information or answer your questions and provide a quote and photos before shipping your Ceylon Fancy Sapphire Large Stones to you. Don’t hesitate or the mines may run out and you will be back to dreaming again. We look forward you’re your inquiry.